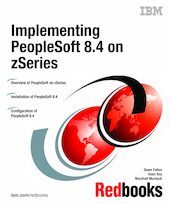 This IBM Redbooks publication will help you install PeopleSoft 8.4 on zSeries with DB2. This information is based on experience gained while installing PeopleSoft 8.4 at the IBM Silicon Valley Laboratory in San Jose, California and on customer support experiences. This book will be especially useful for those who are installing and implementing PeopleSoft 8.4 DB2 on zSeries for the first time. A basic knowledge of DB2, Windows NT/2000, SQL is presumed. Database administrators, system administrators and system designers who need to install PeopleSoft V8.4 using DB2 UDB V7.1 on UNIX and Windows NT/2000 platforms will find useful information pertaining to those tasks.